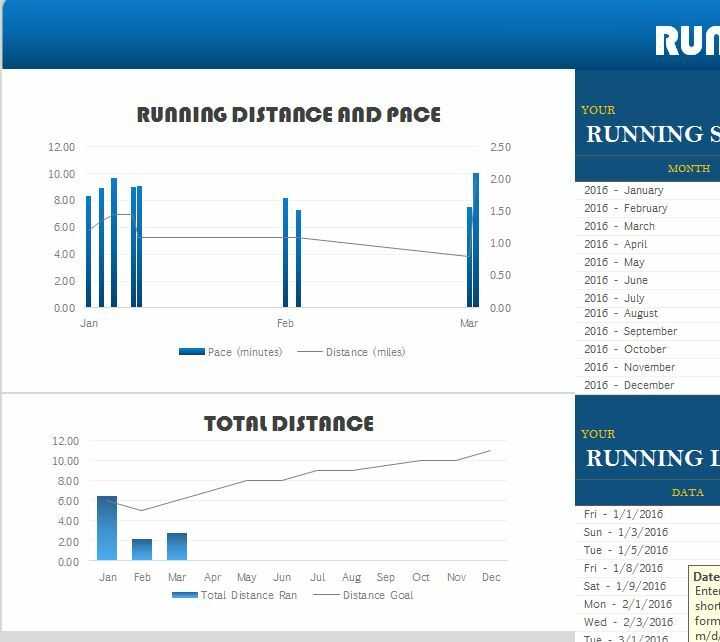 The Running Record Journal can help you achieve your ideal fitness level by tracking your progress over the weeks and see how you can improve your routine. Using this template, you will be able to find out what works for you and what does not. By simply analyzing the trends presented to you in the multiple graph and tables that this template provides you’ll perfect your workout in a way that you never thought possible. Download this free template today to learn how you’ll achieve a better workout and better fitness in general. The Running Record has everything you need available on one page to make things easier for you. You’ll find a running log and a running summary. These tables are where you will enter and view the results of your running workout routines. The top table will track your running in a more general way and the second table really goes in depth. In the first table, enter the month; number of runs, the accumulative distance you ran, and the template will calculate a distance goal for you. The running log is where you can enter more details, such as time and length of individual runs and the template will calculate your pace for each one of those runs. To the left of your Running Record, you will see two corresponding graphs that go along with your jogging schedule. These graphs will show you a line that indicates the trends of your run time and the pace, as well as the distance. You’ll see in the example that this person has improved their pace and increased their distance over the year. Using this template, you will be able to improve any aspect of your running by following the trends of the chart and seeing what routines work best for you.